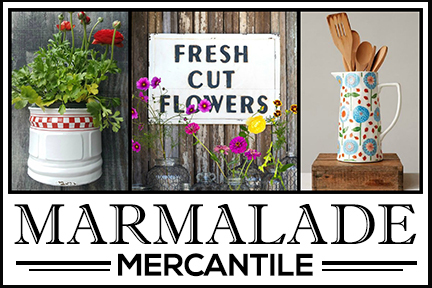 Recently I stumbled onto an adorably charming retro kitchen by Hammer and Hand that I think you’re going to love! I had planned to do a round-up of kitchens, but this one has so many amazing details, I decided to focus on just this one kitchen. 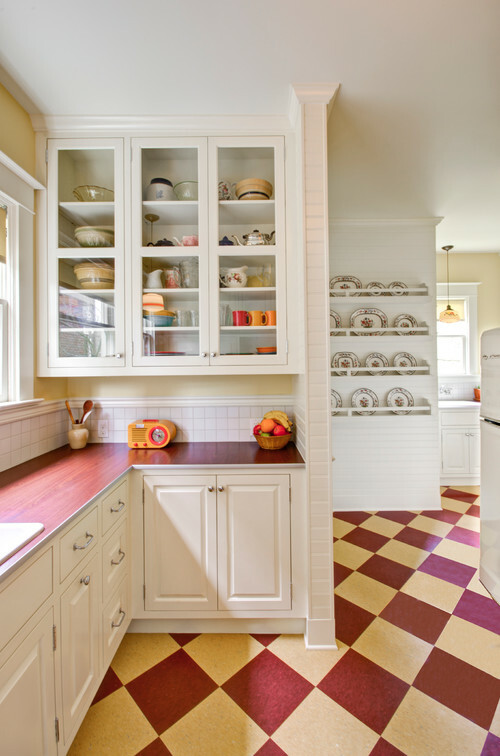 The colorful checkerboard floor is the first giveaway that this is a retro kitchen. It looks like linoleum to me. Did you notice the fun yellow and red radio on the counter? 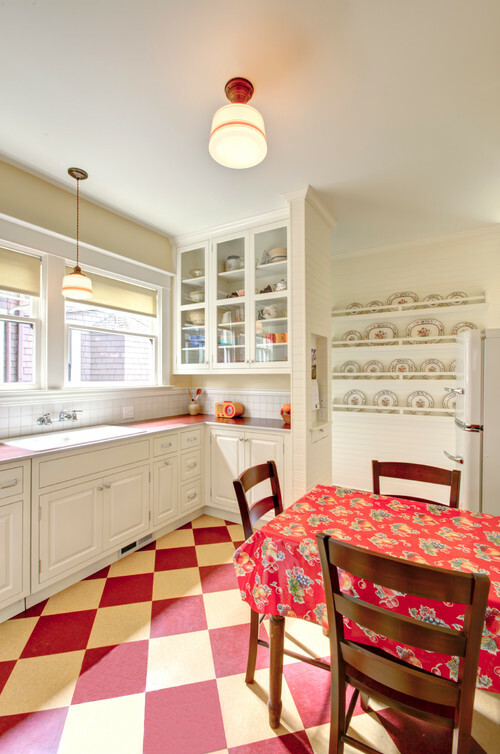 Striped school lights add to the retro appeal of this charming kitchen. A cheery tablecloth enhances the vintage vibe. Roller shades at the kitchen window provide privacy from the neighbors at night. The 50’s style stove is a refurbished unit. A round vent above the stove wears a decorative grate. 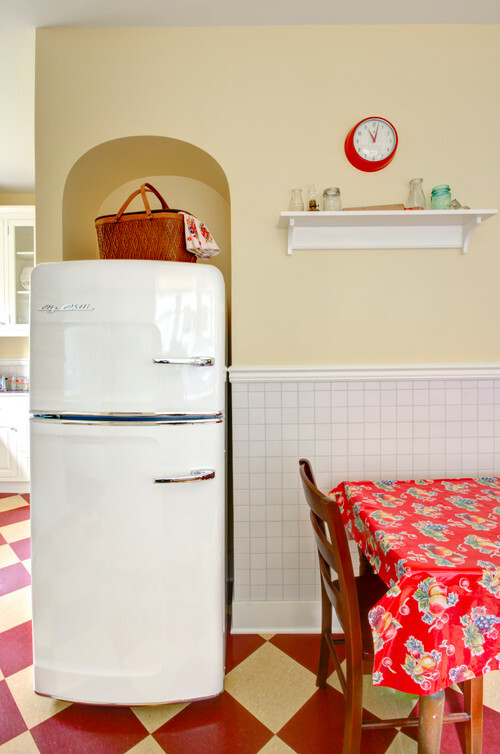 The vintage-style refrigerator is from Big Chill. They make a range of retro appliances in a variety of colors. 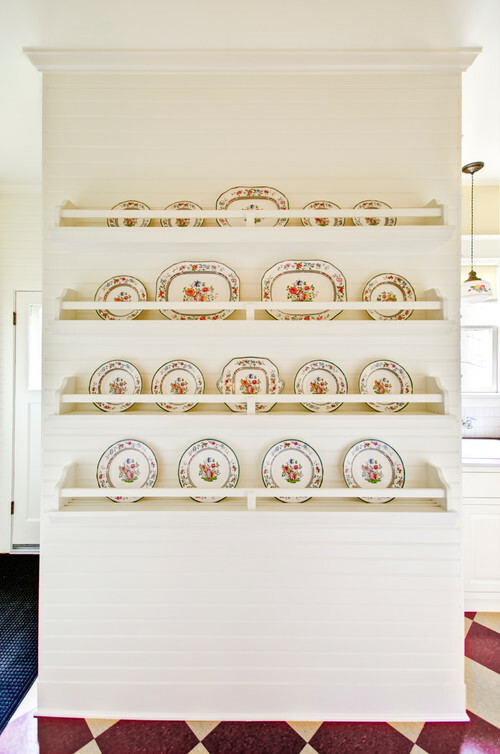 A quaint display rack provides a convenient location to show off heirloom dishes. 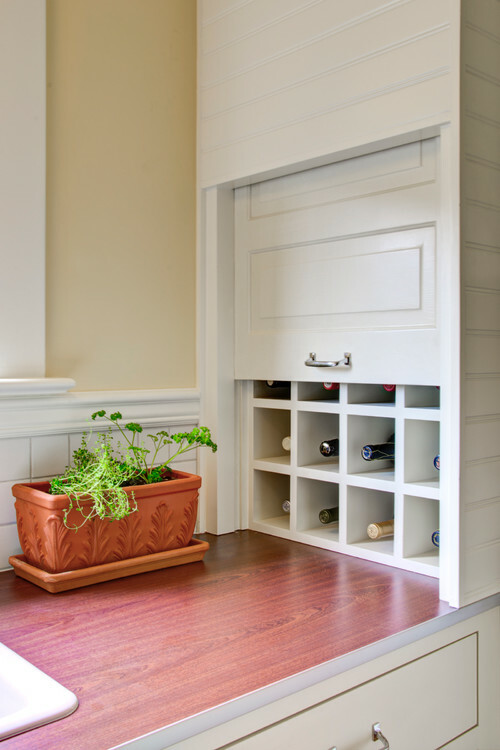 The butler’s pantry enjoys the same architectural details as its adjoining kitchen. 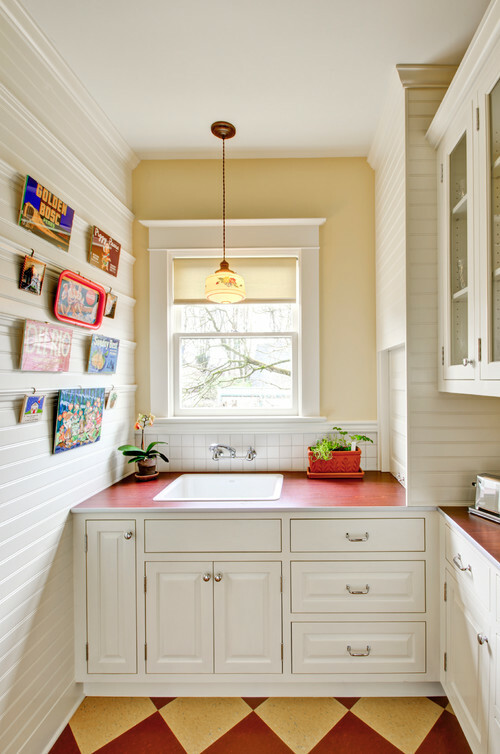 The charming retro kitchen features a little nook that makes a great place for a command center. 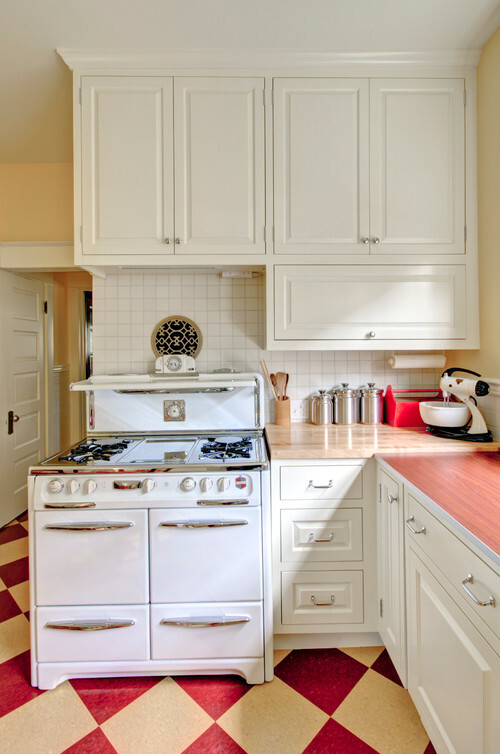 You’ll find so many quaint details in this retro kitchen, like a handy spot for storing wine bottles. 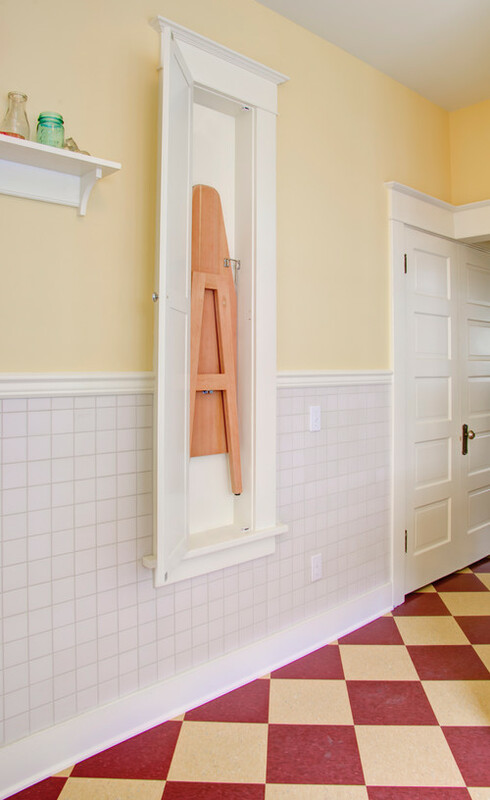 My first home, which was a Sears catalog home, had a similar wooden ironing board in the kitchen. 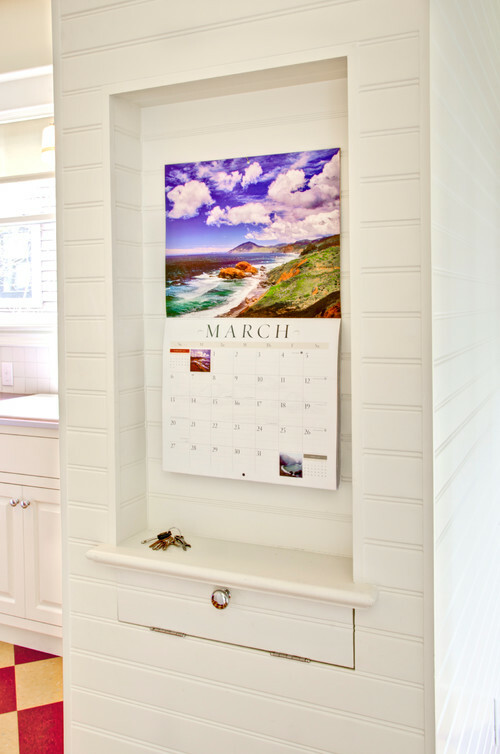 I loved this feature in my first home and wish I had a built-in ironing board today. They just don’t make kitchens like this anymore, do they? 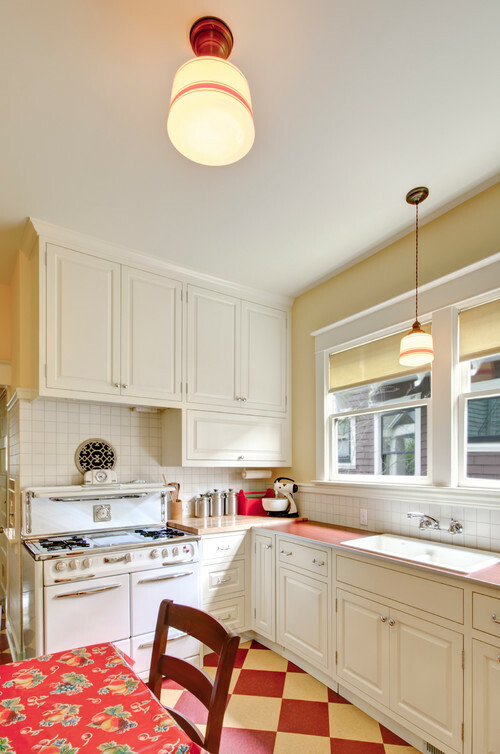 I love every square inch of this charming retro kitchen! 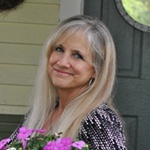 I love this kitchen – a wonderful blend of the old with the new! 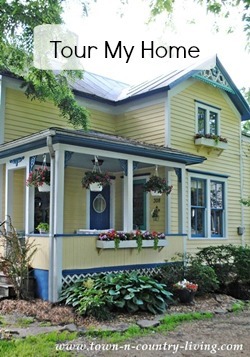 Many aspects of it remind me of my grandmother’s kitchen, which was always to me a happy place. You had me at butler’s pantry! Love this kitchen…the range is wonderful. I have seen red counter-tops in old houses before. 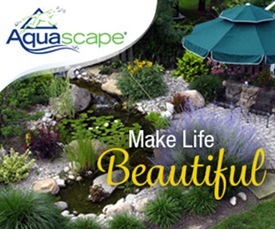 It is a very happy place. This is a dream come true kind of kitchen, i agree it is the best. That’s a charming kitchen . I love all the storage, and the pantry!,, I have seen where people have taken out the ironing board and build it into a spice cabinet . I beleive I grew up with that style stove. With the refurbishing, they probably don’t have to light the pilot for the oven.??? ?